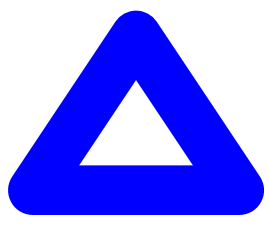 A recent MSDN WPF Forum posting inquired about drawing triangles with rounded corners. I responded with some code but thought it might be good to repeat it here with some visuals. 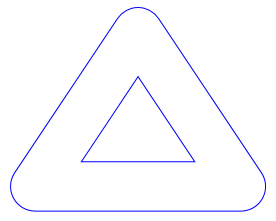 I originally used the Path element for drawing the triangles; for some variety — and also to re-use a Pen object in my code — here I'll render the figure with an Image displaying a DrawingImage based on a GeometryDrawing. 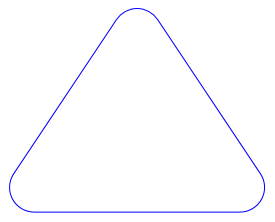 However, if you want a triangle with a thin stroke, this approach won't help. You'll need another solution that involves some code. 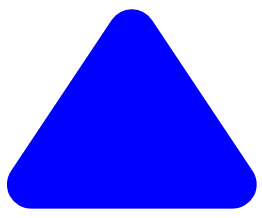 The RoundedTriangle.cs and RoundedTriangle.csproj files comprise a program that displays four progressively derived triangles in the cells of a UniformGrid. 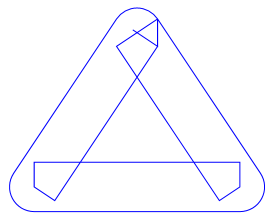 The first triangle is based on a PathGeometry named pathGeo and is the same as the first figure shown above.